We celebrated 100th day in style at Chadron Primary School. Walking around the building you could see ties, headbands, activities, and many other celebrations to commemorate the 100th day of school. We are 100 days smarter, kinder, safer, more respectful, and more responsible. We are so proud of our students - keep up the GREAT work! Members of the Chadron State College Football Team have been volunteering their time to help out in our Read Naturally Lab. These gentlemen visit our Primary Building every week to listen to our kindergarten students read and assist them in reading fluency and comprehension. We also have a dedicated set of parents who volunteer their time as well. Thank you Parents, Coach Larson, and CSC Football! We hope you can all join us for our Parent Teacher Conferences which will be held Thursday, February 2, 2017 from 3:00 p.m. - 7:00 p.m. In order to prepare for our conferences we will dismiss school at 1:30 p.m., so please pick up your children promptly. 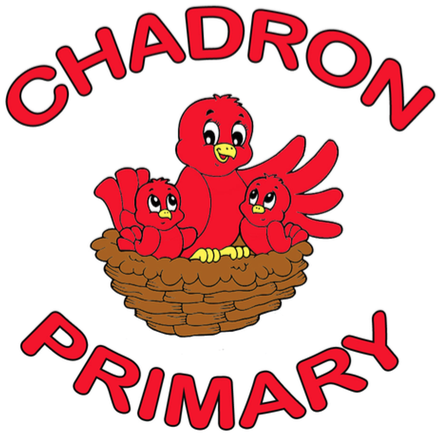 Our conferences will be held in the Chadron Primary School Gymnasium, and you will have the opportunity to visit with your child's teachers on a first come, first serve basis. We would like to keep the conferences to under 15 minutes in order to accommodate our many families. Please make child care arrangements for your younger children as we would like to keep congestion in our gym to a minimum. Thank you for continued support of our teachers and school - see you all on Thursday. 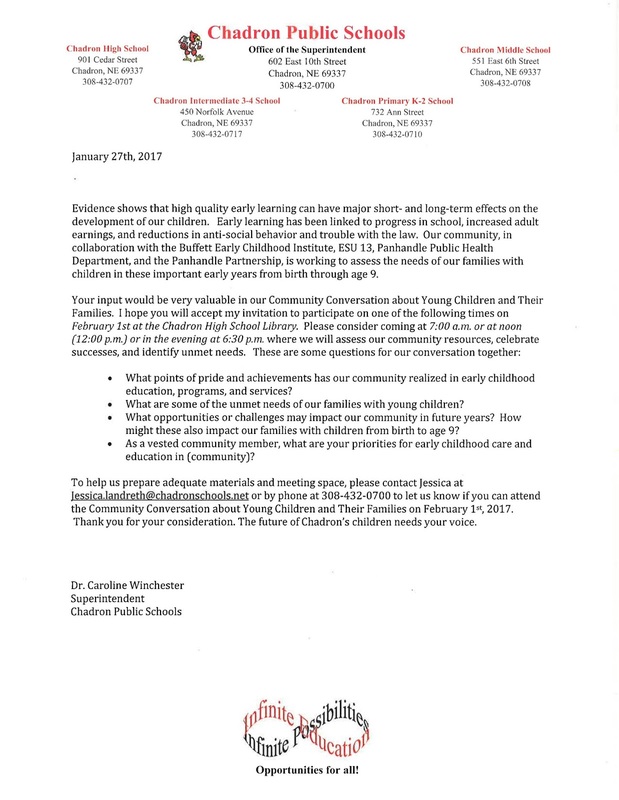 Chadron Primary School and our Parent Involvement Group is on the lookout for Lego Bricks… The group is planning a Penny Carnival set for February 17, 2017 and as part of the games and activities we are seeking new or gently used Lego Bricks or other compatible building bricks. If you would like to purchase and or donate any bricks you can send them with your child or drop them off at the Chadron Primary School Office. We will be accepting any donations from now until the date of our Penny Carnival. We thank you in advance for your support and participation in this exciting event and the theme for this year’s Penny Carnival is “Building Friendships and Families”. The Penny Carnival will run from 6:00 p.m. - 8:00 p.m. and we will have snacks and refreshments. Please bring your entire family to join in our fun!! Thank you again for your continued support of Chadron Public Schools. 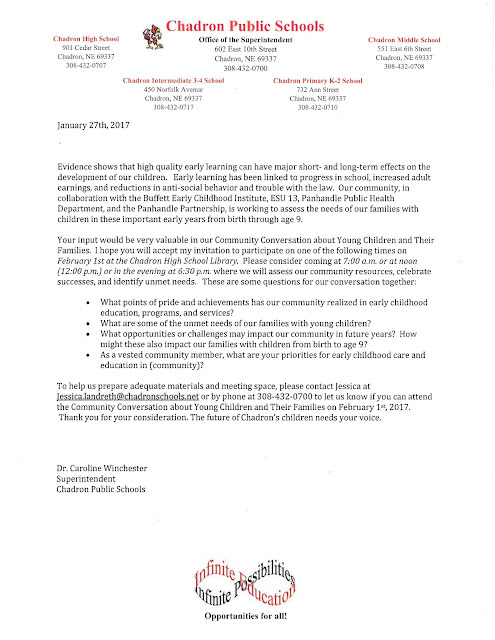 NO SCHOOL for Chadron Public Schools Tuesday (Jan. 24th) due to inclement weather. Stay home, stay safe, read a great book, work on some math facts, and PLAY!! What a delight to have a group of first grade readers share with me some of their new vocabulary. These words are quite incredible when you consider these kiddos are 6 & 7 years old!! We are so excited about our new Wonders Reading curriculum and how much progress our students are making. Here are the first graders rocking the vocabulary cards and definitions in my office: splendid, special, relief, appearance, predicament, determined, and feature. WOWZA!! The Primary Building would like to thank Mr. Mack and the Cardinals Committed group from the high school who visited our lunchroom. These high school students continue to make good choices and set such an amazing example for our little people. We get so thrilled to have them visit and the connections they make with our students is long lasting. Thanks again for coming over, we look forward to your next visit!! Our children were fortunate to be a part of Chadron State College's annual Martin Luther King Jr. March on Monday, January 16, 2017. Our students joined with students from CSC, Job Corps, Intermediate, Middle, and High schools on a march up to the CSC Chicoine Center where Dr. David Nesheim and other organizers put on an outstanding program. We heard from our Superintendent of Schools, as well as other speakers and singers from the Middle and High Schools along with guest speakers from Colorado. We would like to thank Dr. Nesheim and Chadron State College for hosting the event and inviting us to be a part of the celebrations. These students had Perfect Attendance for the entire 1st Semester of school. Thank you to all of the families that make this possible. Being in school and on time is so important for student growth and learning and these students have proven that. Congratulations on a job well done kiddos, keep up the good work! Kindergarten: Back Row - Mayci S., Olivia M., Avarie D., Garner C., Brielle B., and Addisyn P.
Front Row - Roxy T., Nina H., Audrey C., Jennie P., Mikayla O., and Roudy S.
First Grade: Braylon B., Johnathon H., Gracie C., Thaivunh S., and Graycen O. 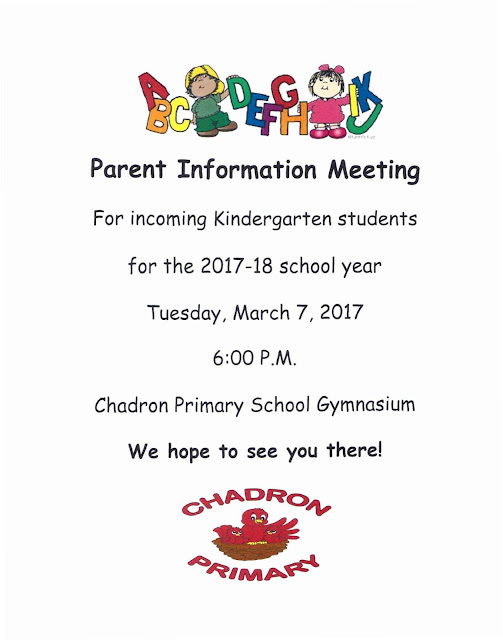 Second Grade: Back Row - Kael B., Maize C., Tristan H., Hannah S., and Madison L.
Front Row - Macy B., Audrey D., Lillie U., and Kole C.
We wanted to let you know the 2016-2017 Chadron Public Schools Health Screenings will be held on January 18 and 19, 2017. January 18th will be 1st, 2nd, 3rd, and 4th grades and January 19th will be 6th, 7th, 10th and 11th grades. These are routine school days so we will be pulling your child’s class for a short time to complete a vision screening (provided by Lions Club), a hearing screening (provided by Lions Club), dental screening (provided by CAPWIN dental) and Blood Pressure, Height, Weight and BMI (body mass index) screenings. 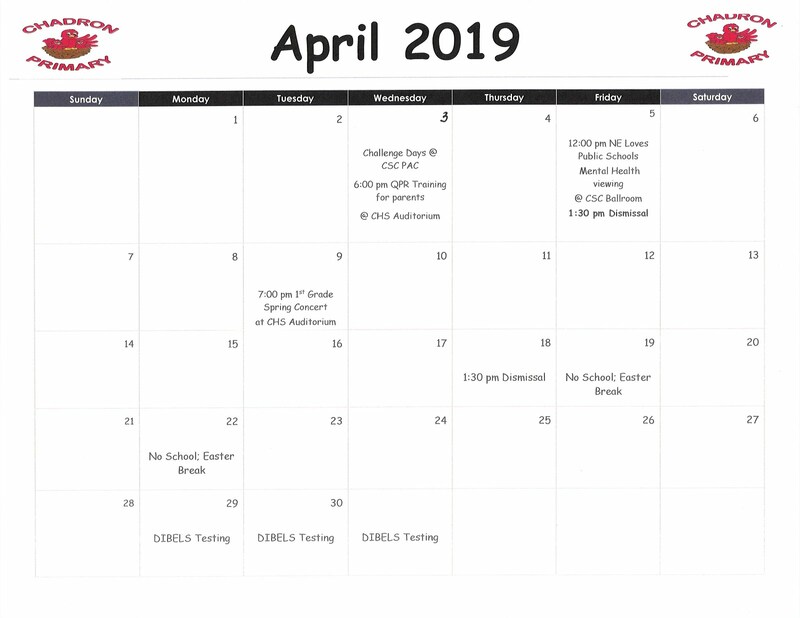 These screenings are not only a requirement by the State of Nebraska but also very important in early diagnosis of potential barriers in a student’s ability to learn and grow! Just a reminder that school starts for students Thursday, January 5, 2017. There will not be any Just For Kids after school programming Thursday or Friday (1/5 or 1/6). JFK will resume Monday, January 9, 2017. We are looking forward to seeing you all again and until then, stay warm and safe.